The Ultimate Cheat Sheet on MONET | Jorge Sette "Linguagem"
Monet is the quintessential Impressionist artist. His paintings sell for millions of dollars today. He is one of the most beloved artists in history and enjoyed a long and productive life, spanning almost 90 years. You will not find many people who do not like his paintings. Maybe because most of them were painted in plein air or open air, the outdoors, and not confined to dark studios, a new characteristic adopted by some artists as of the 1870s. This new way of painting was facilitated by the easiness of transportation provided by the steam vapor trains, the more easily to carry easels and the new paints bought in the recently-fabricated screw-top collapsible tubes. These points I listed below summarize the life and work of one of the greatest artists the Western Culture has ever produced. 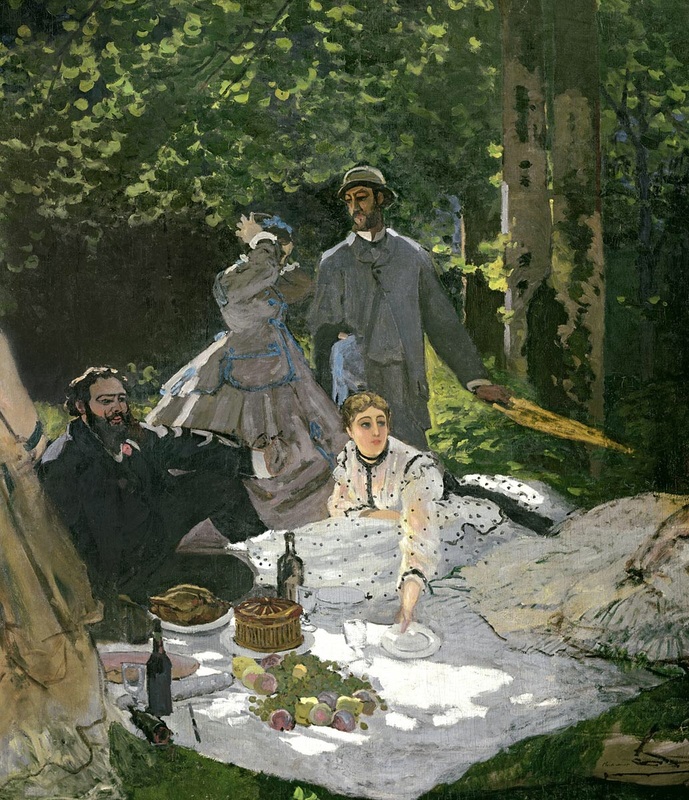 You can read and possibly quote from them to sound more knowleageble and sophisticated at the next dinner party you attended, if, despite loving Monet’s ouvre like most people, you don’t know much about him. 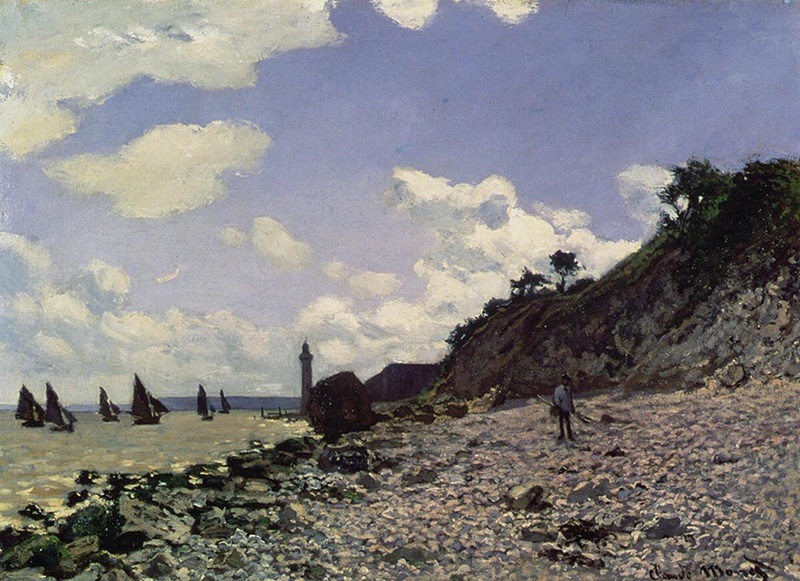 1, He was born as Claude Oscar Monet on 14 November 1840 in Paris, but spent most of his childhood on the northern coast of France, Le Havre, where his family had moved to in his early infancy. 2. He was utterly bored in the traditional school and spent most of the time drawing caricatures of his teachers and other well-known people in the town. His caricatures became very popular and he started selling them at local store, being able to earn a living very early in life. 3. He happened to meet a plein air landscape painter, Boudin, who practically became his coach and mentor, developing in Monet the taste for painting seascapes and landscapes, observing the fleeting reflections of the sunlight in the sea water, trees and leaves. After his apprenticeship with Boudin, it was hard for Monet to be happy painting or copying famous works of art as a trainee confined in the crowded rooms of museums and art galleries. His painting was all about vibrant colors, vivid scenes, ordinary people often seen at a distance, the effects of light at different times of day and in different seasons upon the same objects. An obsession for water and its innumerable ways of being represented on canvas. Monet wanted to paint contemporary life the way it appeared to him. 4. Monet was sent by his parents to the Acadeémie Suisse in Paris, whose flexibility and respect for the individual idissioncrasies of the students resonated with Monet’s personality. Soon afterwards he was called up for military service, though, and served with the armies in Algeria. He claims that the exposure to the light and motifs in Africa had a great influence on his style of painting. He did not stay long in the army however. Family influence and health problems allowed him to be discharged after two years. 5. Back to school in Paris, he started as an apprentice in the studio of Charles Gleyre in 1862, where he was lucky to meet what was to compose the core of the impressionist group of painters in the future: Renoir, Sisley and Bazille. They became inseparable friends, spending a lot of time painting together outside of Paris in the forest of Fontainebleau. 6. It was very difficult for this wave of new painters to have their works accepted by the conservative official artistic exhibition in Paris, the Salón, held ever year at the Académie des Beux-Ar, which attracted thousands of visitors. The Salón favored more traditional works of art, with perfect finishes, depicting usually historical, mythological or religious subjects. Those paintings, done in dark colors, replicated the techniques known since the Renaisssance and covered the walls from ceiling to floor. 7. 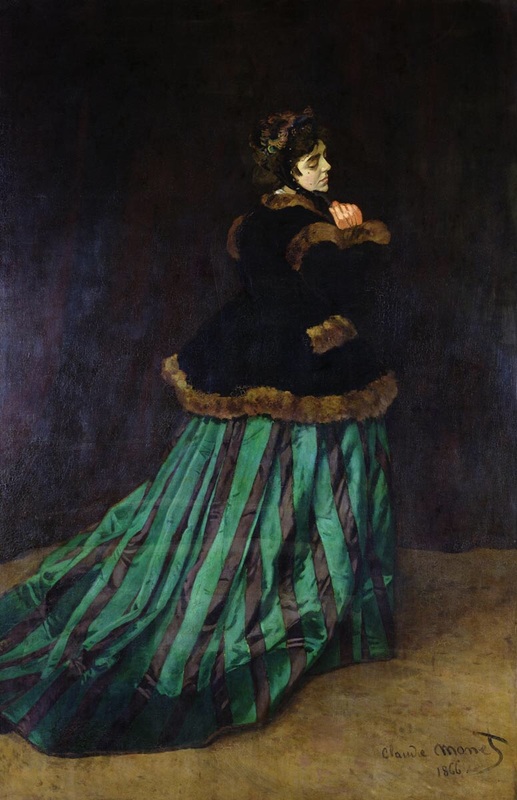 Despite having a few works accepted at the Salón, such as the Woman in the Green Dress, inspired by the woman he loved and lived with at the time, Camille Doncieux, who posed for it, Monet and his friends had most of his works refused by the Salón, which led them eventually to create their own exhibitions. 8. To escape the Franco-Prussian war in 1870, Monet, already married to Camille and with a son, moved to London, living there for some time and returning via Holland. Many of his works were painted in these countries, where he was heavily influenced by the contact with the works of Turner and Constable. 9. In 1874, the group of new artists decided to produce the first of their own parallel exhibitions, which, ridiculed at the beginning and attracting very few attendants, was ferociously attacked by the art critics. 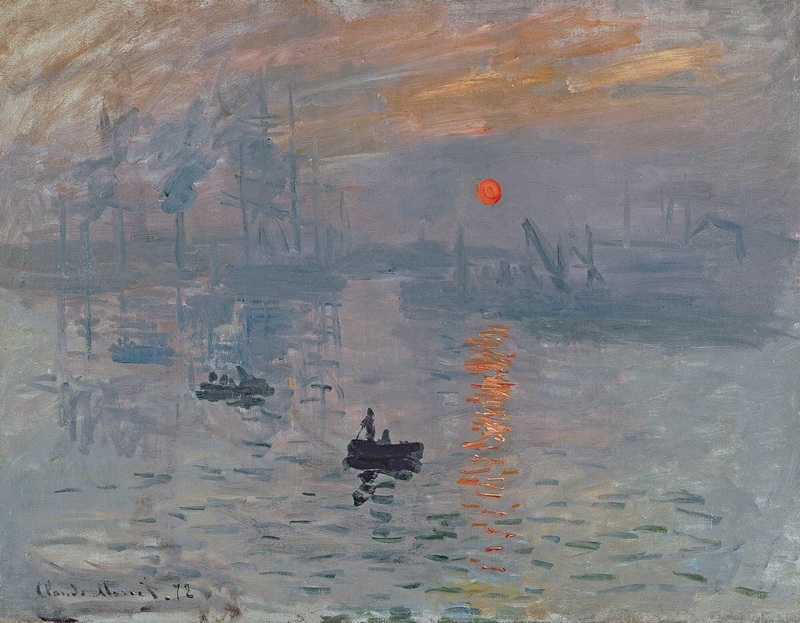 A famous art critic involuntarily named the movement IMPRESSIONISM, when making derisive comments about a Monet’s painting titled Impression: Sunrise, which showed a simple blotch of red color representing the sun hovering over the sea and casting its reflections on the water for the delight of a few early fishermen in a couple of boats. The artists of the movement did not not take the critic seriously and started using the name for their style, as they had enjoyed what was meant as an insult. The exhibition grew every year, being repeated 8 times over the course of the next 12 years. As times moved on, the eyes and minds of the viewers, influenced by the increasing praise of art critics, began to appreciate and accept the new artistic movement. 10. Around 1990 Monet started developing his famous series paintings: featuring haystacks, poplars, the cathedral of Rouen and the famous water lilies, which he showed in a number of sequential cavasses, many of them painted one after the other, with the artist moving from one canvas to the next, arranged in a row in the fields, so that he could capture the slight variations of the effects of the changing light on the subjects, as the sun moved in the sky. He would work on them in a sequence of consecutive days. 11. A heavy smoker, Monet died of lung cancer on 5 December 1926 in his house in Giverny in 1926, where he had created a wonderful garden and a pond in the grounds of the property, which he began to use as the main topics of his latest paintings. He lived a full, long, productive and recognized artistic life. His house and garden in Giverny are famous and popular turistic sites in today’s France. Hope you enjoy the ebooks. Give us your feedback by rating them on Amazon.com or by writing some feedback in the comments section of this blog post. This entry was tagged Camille Doncieux, Claude Oscar Monet, garden, gyverny, haystacks, impressionism, learning english, monet, poplars, renoir, salón, teaching english, water lilies. Bookmark the permalink. This was a fabulous and informative read. Glad you liked it, AnnMarie. Thanks for the feedback.